Damn! She's gotta take a lot of vitamins, because she knows that if those robots were to defeat us, it'd be tragic. What I mean to say here, is, well, GREAT banner, Adam. Love what you`ve done so far Jad. Looking forward to seeing it develop further. Great looking character! Don't worry, i doubt i'll be keeping that wing icon. Although i'm not sure what to do as a replacement. the dancing is the only thing that redeems this song. ^^ Lookin' sweet, though. hey just wanted to let you guys know awesome job so far keep it up! Locust, when I listen to the music while looking at the art, I am ever so creeped out. The mock up is quite nice, though. Mod edit: that link doesn't work. Host somewhere else. Edit: Alright, but it seems to work fine for me. Is he a dot or is he a speck? & on that basis - I think your version of particle man is a tad big...? or maybe triangle man is too small? I think it's a WIP; now that I look at it, particle man looks like he was whipped up in seconds. Griffy - How did you do that wall? It looks...strange to me. I agree. 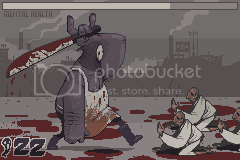 Did you use some sort of.. interesting pixel brush? Are you saying I used the spraycan? Cause I didn't. Don't feel like explaining what I did ATM, but it does NOT involve any funky paint tools, I promise. Nice! 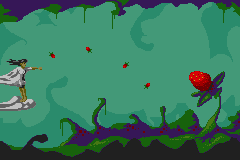 I sure wasn't that good when I started pixel art. Xeno-Striker: i think its pretty nice. I really like the disayn on the boss there, makes me think of han(treasure, gunstarheroes etc.) stuff n of couse gish, hehe. kewl huds too. for crits; it kinda feels like the shading isnt really finished. the players have outlines and the boss have shadows. I've been wanting to both pixel something Machinae Supremacy related and use the C64 palette for ages, so I took this opportunity to marry the two. Supposed to be MaSu's Masquerade, but there's not much to indicate that yet (only the soldierish sprites are supposed to be wearing masks a la masquerade). Not really sure where it's going yet. Using ptoing's C64 colours. Colours only, no other C64 technical restrictions. I must say I quite like the colours. 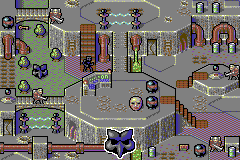 Certainly kicks the standard EGA palette's arse. ..yes. In other words, I'm not as good as that now. Is that path going vertical away from the central platform supposed to be of the same texture as that going off to the left? if so, I think the lines are much to compact on the former. Also, is that green stuff liquid? It doesn't really read as such. Awesome though. Tried reworking north-south bridge and generic toxic slime stream. Still not really happy with the bridge, but it is correct for camera (half-length floor vertical). I might just take the easy way out and double the slab width. The grey floor is looking quite monotonous and I've tried dithering in some subtle colour, but it just ends up looking noisy. Any tips would be appreciated. im loving it surt, have you considered using the darker grey on the lower ground? for depth's sake. Terley: Looks a bit too dark then I think. Xion: Considered it, and might if I have too, but given the reasonably complex structure it'd be a lot of tiles. AdamAtomic: Dither is the first thing I tried but given these colours I couldn't find a combo that was sufficiently low contrast and sufficiently ungarish. Just got to decrappify it. Is it readable enough without shadows or whatever else? Usurper seizes the planet's aristocracy during the Grand Masquerade Ball, enslaving all attendees with the enigmatic Masks. Your enslavement doesn't go as planned, and you retain your will, but lose your self. Taking advantage of your immunity from the enslaving power of the Masks you use each type of Mask's special abilities to fight the Usurper's enslaved minions and free your planet. Wearing a Mask you take on that Mask's form and abilities, becoming non-threatening to slaves of that Mask type. The Pearl Mask gives you the form of the Pearl Faces, the cannon fodder of the Mask slaves (allowing you to pass them without them attacking you). 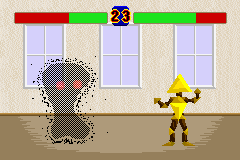 On contact with a Shadow Mask you are transformed into a ethereal form that allows you to pass through obstacles, but you are unable to interact with your surroundings until you "remove" the Shadow Mask by touching a Shadow Mask again and return to your prior state (works like a slow teleport between Shadow Masks, and useful for reconnaissance). As far as subtle dither goes all the lumapairs should go together nicely. Basically the pairs with the same grey value should make for unintrusive ditherfills.